This strategy inter alia appears to have worked. A tracker poll conducted by Times Now and VMR shows that NDA stands to gain 13 seats as compared to projections earlier. This article highlights measures taken by BJP led NDA to widen political coalition and social safety-nets adequately across all sections of people. Indian stock indices had gained 3.5 percent following the announcement of election dates and opinion polls in March 2019 indicating that the BJP-led coalition is likely to return to power for the second time, after the election outcome on May 23, with a gain of 30-40 seats for the BJP compared to early February. These programmes have been made possible due to Jan Dhan Yojana, Aadhaar and Mobile. Having bank accounts linked to Aadhaar was good in terms of unique beneficiary identification and undertaking targeted cash transfers. To ensure it, the BJP has stitched important pre-poll alliances particularly in the state of Assam and other North-Eastern states, which can drive a gain of 6-10 seats, said CLSA’s India strategist Mahesh Nandurkarrecently. BJP had strong differences with AGP in Assam and its allies in North-East on the Citizenship Amendment Bill. But now it has not only promised a re-look of the Bill, but it has also got back the AGP on the table for the Lok Sabha elections and get the Bodoland People’s Front on board. The BJP is moving in fast. For example, it offered the sitting Giridih seat in Jharkhand to All Jharkhand Students Union (AJSU), from where its president Sudesh Mahto is poised to contest as NDA candidate. In Tamil Nadu, after AIADMK, it won over DMDK to its side. Modi has been personally in touch with Akali Dal leader Prakash Singh Badal while his party has yielded more seats to Nitish Kumar’s JD(U) in Bihar and equal share to its pesky partner Shiv Sena in Maharashtra. Further, after flexing muscles for a few days, BJP’s UP ally Apna Dal (Sonelal) has agreed to continue its alliance with the saffron party on the old terms. This strategy inter alia appears to have worked. A tracker poll conducted by Times Now and VMR shows that NDA stands to gain 13 seats as compared to projections earlier. 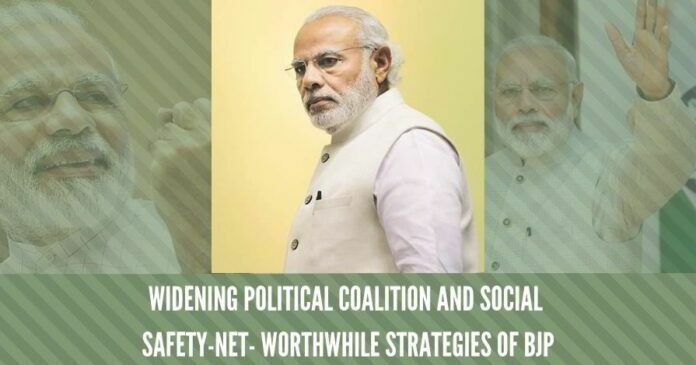 This apart, because in India social security and healthcare architecture has been in a disarray, the present government has adopted a priority approach for widening the social safety-nets adequately across all sections of people. The biggest of the directed social welfare measure has been Ayushman Bharat. The healthcare programme, which enrolls almost 50 crore people, identified based on the 2011 socioeconomic census data, brings affordable healthcare to the doorsteps of those who most need it. Another safety net that the Modi government created in the 2019 Budget was the Shramyogi Man-Dhan Yojana. This programme addresses the pension issue. Participants in this programme can self-select and enroll for a pension to be paid after 60 years of age – the amount fixed is Rs 3,000 per month. Sukanya Samriddhi Yojana was started by the government early on in its tenure. The programme encourages parents and guardians of the girl child to save regularly for her education and marriage. Part of the larger BetiBachao, BetiPadhao programme, the contributions get income tax benefits as well. The Atal Pension Yojana was introduced by the government in 2015, again targeted at the unorganized sector workers. This programme has seen an enrolment of 1.5 crore subscribers since the launch. Participants can join between the age of 18 and 40 years, and get between Rs 1,000 and Rs 3,000 per month in pension, depending on the contributions and age of joining. In 2015, the Modi government also launched two other insurance programmes. The Pradhan Mantri Jeevan Jyoti Bima Yojana is for subscribers between 18 and 50 years of age. An annual premium of Rs 330 is payable for this programme. The insurance coverage is Rs 200,000. Most banks offer auto-debit and enrolment facilities for this programme, with the yearly premium payment. The Pradhan Mantri Suraksha Bima Yojana was launched to cover for death and disabilities due to accidents. Participants can avail of the programme while being 18 to 70 years of age. The annual premium is set to only Rs 12. In the event of death in an accident, the cover payment is Rs 200,000. The government launched the Pradhan Mantri Vaya Vandana Yojana, which helps senior citizens in better financial planning. Senior citizens get a fixed 8 percent return for 10 years for their deposits up to Rs 15,00,000 under this programme. They are eligible to join until 2020 and participants also get financial advice as part of the programme. These programmes have been made possible due to Jan Dhan Yojana, Aadhaar and Mobile. Having bank accounts linked to Aadhaar was good in terms of unique beneficiary identification and undertaking targeted cash transfers. This help in de-duplication of beneficiaries availing different schemes, and also in ensuring that middlemen were cut in the operational chains. Increased mobile penetration in the country has helped in simplifying workflows for participants, especially those who often fear to approach a bank or government offices as paperwork puts them off.